Please provide a valid credit card expiration date. Please provide a valid credit card number. SECURITY POLICY: Your payment and personal information is always safe. Our Secure Sockets Layer (SSL) Software is the industry standard and among the best software available today for secured commerce transactions. All of your information is encrypted and is not stored in plain text on our server so that it cannot be read over the internet. CANCELLATION POLICY: With more than a 48 hour notice from check-in time which is 2PM there will be no charge and will be eligible for 100% refund on any deposits that have been made. 24-48 hour notice from check-in time (2PM) there is a 25% charge. Less than 24 hour notice (2PM) is 100% charge. You will receive an email securing your reservation withing 2 business days. 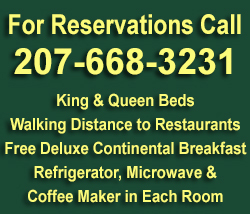 For faster service call us at 1-207-668-3231.